Sign up for Broadjam today to follow Jim Pfeifer, and be notified when they upload new stuff or update their news! I wrote this piece to express the feeling of sadness and longing felt when you find a box of old photos in an attic and reminisce about people in the photos who have passed away, and life's memories of people who are no longer with you. Results: Viewing items 1-5 of 78. Nice instrumentation that lays a perfect sound bed down under the beautifully simple string and piano lines. Calm, strong, inquisitive all come to mind. The piano melody is so communicative and has tons of emotion. A really great tune. My mind was set to roam the landscapes of my imagination with this sweet gem. Open to interpretation, I see rolling landscapes, greyish skies, waves pounding rocky shores. 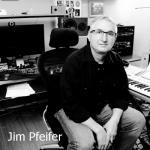 Thanks for supporting Jim Pfeifer! Would you like to help Jim Pfeifer get heard by industry pros by buying them a song submission credit to Broadjam Music Licensing Opportunities?